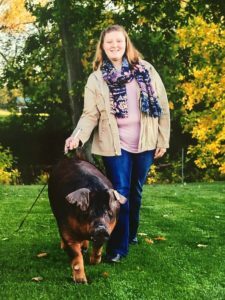 SILVER SPRINGS (May 31, 2018)-The New York Corn and Soybean Growers Association is pleased to announce Melissa Keller as the recipient of the 2018 Bill Jenkins Growing the Next Generation Scholarship. Melissa hails from Corfu, NY and has just completed her freshmen year at The State University of New York at Cobleskill where she is majoring in Animal Science. Melissa is extremely active in numerous agricultural pursuits including the American Animal Producers Club, the Ag Business Club, Genesee County 4-H Clubs, Genesee Valley FFA, New York Holstein Association, National Junior Swine Association, New York Pork Producers Association and the New York Junior Beef Producers Association. The Bill Jenkins Growing the Next Generation Scholarship honors the life and work of Bill Jenkins, a longtime director and founder of the Association who passed away in July of 2017. Bill provided years and years of experience, enthusiastic volunteering and comic relief to the Association. He exemplified what it means to serve and was passionate that we continue to grow and promote the industry. Funds for the scholarship were raised last Labor Day when the Association created the first ever Human Corn at The Great New York State Fair. The massive corn formation was comprised of hundreds of people wearing green and yellow t-shirts and included many of Bill’s friends and family. Patty’s People Pictures of Buffalo, famous for their Buffalove brand and aerial photography work, arranged the photograph. The event was sponsored by Howlett Farms, Community Bank and the Country Folks. The NYCSGA applauds Melissa for her achievements and looks forward to watching the next generation continue to grow!